Nearly two thirds (61%) of the engineering and technical workforce consider the recruitment of engineering and technical staff with the right skills as a barrier to achieving their business objectives over the next three years, results from the 2017 Skills and Demand in Industry report, published by the Institution of Engineering and Technology (IET) show. 75% agree that tackling the skills problem is fundamental to making the Government’s Industrial Strategy viable. The majority of businesses (78%) believe that digital technologies and automation in UK engineering and technology sectors will advance rapidly over the next five to 10 years, yet only 30% have firm plans to introduce or extend their use of digital technologies in the next three years. However, where businesses do plan to increase digitisation of their processes, there is wide acceptance, by 85% of businesses, that they will have to recruit people with new skills, up-skill their present staff, or do both. 87% of companies surveyed do not have LGBT/BAME diversity initiatives in place and only 15% make particular efforts to attract and retain women in engineering and technical roles (beyond observing statutory equality requirements). Just over one in ten (11%) of the UK engineering and technical workforce is female. 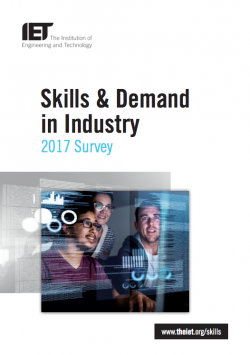 To address these growing concerns over the skills gaps in the engineering workforce, 81% agree that more employers need to provide work experience to help improve the supply chain, but shockingly only 30% of all employers acknowledge that it is their responsibility to invest in the necessary training to meet the skills challenges posed by increased digitisation and automation. Encouragingly 40% are proactive in offering engineering apprenticeships in their business, with about one third (31%) counting at least one engineering or technical apprentice among their workforce at the time of the survey. Joanna Cox, IET Head of Policy, said: “As the UK goes through a period of economic uncertainty, the skills shortage in engineering remains an ongoing concern for engineering companies in the UK. In response to the skills demand, the IET has launched ‘Work Experience for All’, a new campaign which brings together employers, universities, further education colleges and policymakers to collaborate on developing the quality of work experience and internships for those in education or training, to improve the supply of engineers and technicians coming into the industry. This is the twelfth year that the IET has published its skills report. The report is based on quantitative research commissioned by the IET and conducted by market research agency BMG Research. The insight for this report was gathered from telephone interviews with 800 UK employers of engineering and technology staff, representing a range of engineering sectors and sizes and drawn from across the UK in May and June 2017. Businesses were identified using standard industrial classifications. The research is supplemented by 11 in-depth interviews with individual organisations of different sizes undertaken in September 2017. While there is some optimism from employers about being able to recruit the engineers they need, concerns about skills gaps and diversity issues, the role of education, and a lack of experienced engineering staff all come under the spotlight. • 61% consider the recruitment of engineering and technical staff with the right skills as a barrier to achieving business objectives over the next three years. • 75% agree that tackling the skills problem is fundamental to making the Government’s Industrial Strategy viable. • 75% of those that plan to introduce/increase the use of digital technologies need to develop new skills in their existing workforce. • 30% have firm plans to introduce or extend their current use of digital technologies in the next three years. • 39% reported an increase in their engineering and technical workforce over the last three years. • 46% face difficulties in the availability of people in the external labour market with the right skills when they try to recruit. • 51% expect to employ more engineering and technical staff over the next three years. • 31% currently count at least one engineering or technical apprentice among their workforce. • 59% have arranged or funded technical or job-specific training for engineering or technical staff over the last 12 months. • 30% of all employers acknowledge that it is their responsibility to invest in the necessary training to meet the skills challenges posed by increased digitisation and automation. • 81% agree that more employers need to provide work experience for those in education or training to help improve the supply of engineers and technicians. • 11% of the UK engineering and technical workforce is female. • 15% make particular efforts to attract and retain women in engineering and technical roles (beyond observing statutory equality requirements) (4% don’t know/refused).